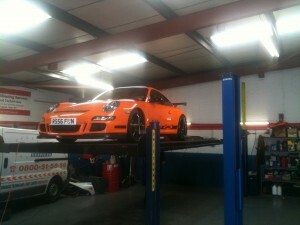 We use the state of the art technology for our vehicle wheel alignment, the Hofmann Dynaliner Alignment Laser system. 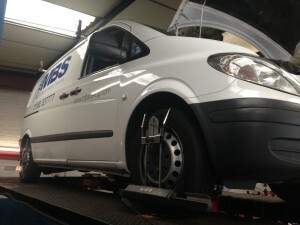 This provides a fast and accurate wheel alignment ensuring your vehicle tracking is perfect. Incorrect wheel alignment will result in rapid irregular tyre wear and will affect the handling and safety of your vehicle. If you have had new tyres fitted it is recommended to have your tracking checked to ensure you get the best our of the tyres. A vehicles wheel alignment can be affected by many things one of which could be hitting a pothole in the road and with the roads today being poorly maintained there are more pot holes than ever. If you accidently drive into a kerb or there is fault on your vehicle where by you have excessive wear to a steering or suspension component then this can cause problems and will need a quick inspection. The alignment of a vehicles wheels and tyres is important to be accurate to the original specification supplied by your vehicle manufacturer and if the vehicle is setup correctly then you will get the most out of your tyres life and the vehicle will drive much smoother and safer. Wheel alignment other wise known as tracking involves checking the wheel position and angles against vehicle manufacturers’ specifications. These are known in the trade as toe in, toe out, positive camber and negative camber. If the front of the tyres are closer or further apart than the rear of the tyres then you have a TOE problem. The camber mostly affected by potholes in the road and this is the inward or outward tilt of a tyre which can result in uneven tyre wear. We offer alignment for all types of vehicles from Cars to Vans and 10″ to 24″ Wheels.